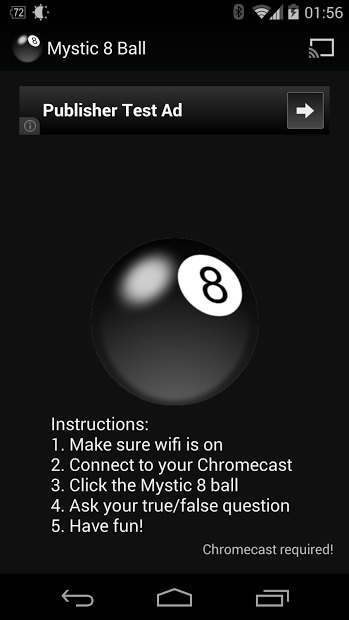 Mystic 8 ball is an app that reproduces the famous magic 8-Ball game by Mattel. In particular i only seen that into 90’s movies from USA and now i have the chance to play it :P. I know, is not that ‘wow’ thing but it made my day. How it works for those don’t know nothing about it? What you can do with that app? You can get all of the answers to all of life’s most important questions by simply asking a question like: Will I be happy? Will I marry? Does he/she like me? Will I have a family? Is it going to rain tomorrow? You can ask anything you want, of course, those are just some examples. Note: This is just a kind of a game, don’t take it so serious :). 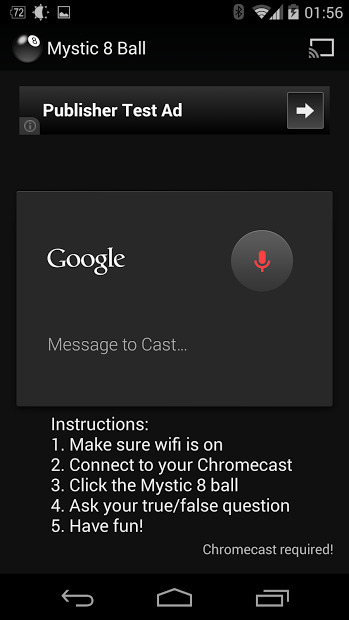 Chromecast is not longer required to play but you still can connect it to your TV.